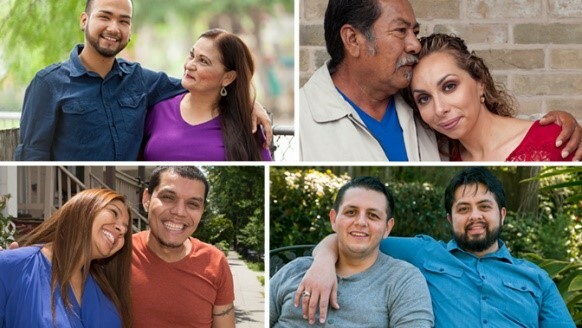 MENLO PARK, Calif. – Greater Than AIDS released a powerful new short-form documentary series Somos Familia (We Are Family) to bring attention to the impact of HIV/AIDS on Latinos leading into National Latinx HIV/AIDS Awareness Day (Oct. 15). One in five people living with HIV in the U.S. is Latino. The stigma associated with HIV keeps many from seeking prevention and treatment services. According to the Centers for Disease Control and Prevention (CDC), more than half of Hispanics/Latinos living with HIV in the U.S. are not engaged in care. Through personal stories of families with loved ones living with HIV, in both Spanish and English, the campaign reinforces the importance of social support for people living with HIV. A mother and son, a father and daughter, two pairs of siblings, share challenging moments of diagnosis, disclosure, and, ultimately, triumph as they learned more about the disease and sought treatment. Research shows people with HIV who have strong support networks are more likely to get and stay in care, which both improves health outcomes and reduces the spread of the disease. Conversely, fear of judgment and rejection can delay a person from seeking lifesaving treatment or even knowing their status. “The families featured in Somos Familia provide an intimate look into the experience of finding out a loved one is living with HIV, and how knowledge and care make all the difference,” said Tina Hoff, Senior Vice President and Director of Health Communication and Media Partnerships at the Kaiser Family Foundation, which directs Greater Than AIDS. Victor and Silvia, a brother and sister featured in the series, have always been close. Still, Victor struggled to tell Silvia he was living with HIV. When he did, it was a relief to know that it wouldn’t change anything between them. Victor goes on to explain how with treatment he has been able to reduce the amount of virus in his blood to very low levels, which for someone with HIV means better health and significantly less chance of passing the virus to others. Produced as part of the Virginia Greater Than AIDS (Virginia>AIDS) and Texas Greater Than AIDS (Texas>AIDS) public information partnerships, the series is also being shared nationally. The Virginia Department of Health is distributing the campaign across the state with targeted out-of-home, radio, TV and digital media messages, as well as hosting town hall conversations in select cities. Health and community partners in other high impact areas are using the series to support local outreach. Community toolkits – including informational resources, posters, and other items highlighting local services – are being distributed to AIDS service and other community-based organizations to support on-the-ground outreach. For more about the campaign, informational resources, and to watch the videos, go to: familia.masquesida.org or family.greaterthan.org (English). Greater Than AIDS is a leading national public information response focused on the U.S. domestic epidemic. Launched in 2009 by the Kaiser Family Foundation and Black AIDS Institute, Greater Than AIDS is supported by a broad coalition of public and private sector partners, including: major media and other business leaders; Federal, state and local health agencies and departments; national leadership groups; AIDS service and other community organizations; and foundations, among others. Through targeted media messages and community outreach, Greater Than AIDS works to increase knowledge, reduce stigma and promote actions to stem the spread of the disease. While national in scope, Greater Than AIDS focuses on communities most affected. The Kaiser Family Foundation, a leader in health policy analysis, health journalism and communication, is dedicated to filling the need for trusted, independent information on the major health issues facing our nation and its people. The Foundation is a non-profit private operating foundation based in Menlo Park, California and is not affiliated with Kaiser Permanente.